I love The Critical Thinking Co. This past month, we've been privileged enough to have U.S. History Detective, Book One in our home for review. They say this book is for grades 8-12, and I think that is a great recommendation. What I really love about this book is that you can use the material to supplement your history program, or you can use it as a stand-alone US history program. Either way, there is fantastic material available. This book covers Colonial America up through Reconstruction. It contains a total of 65 lessons, split into nine sections. 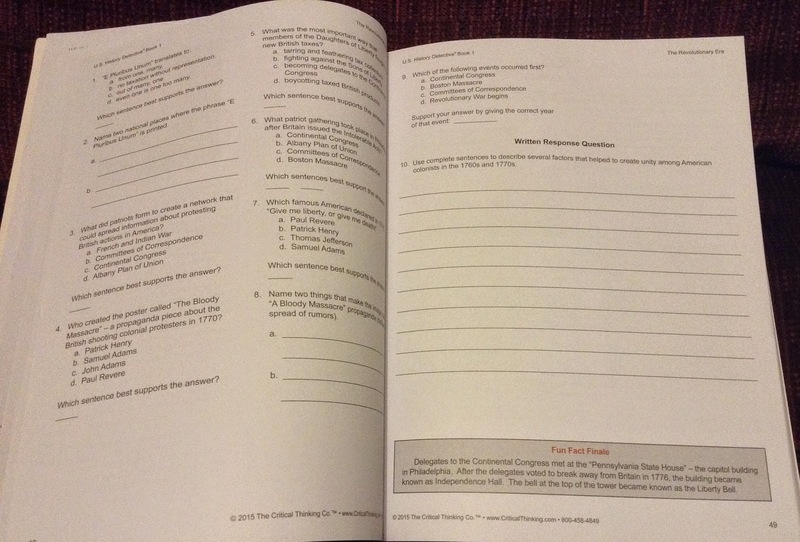 Each section includes some introductory material and some review material. Let's take a look at Section 2, which is about the Revolutionary Era. 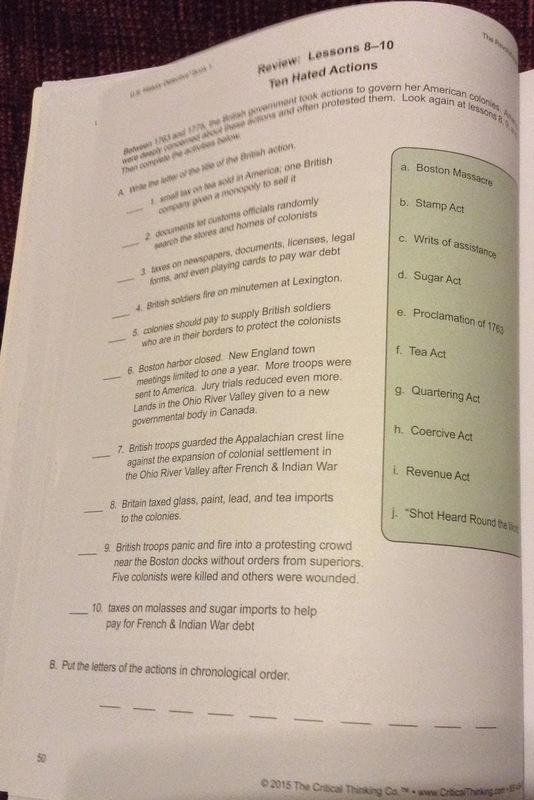 Section 2 starts off with a single-page introduction, which includes a couple paragraphs of text, a map of the United States in 1783, and a timeline that goes from the French and Indian War of 1756-1763 up through the War of Independence of 1775-1783. This sets you up for the lessons that follow. The first lesson (Lesson 8) is on the French and Indian War. 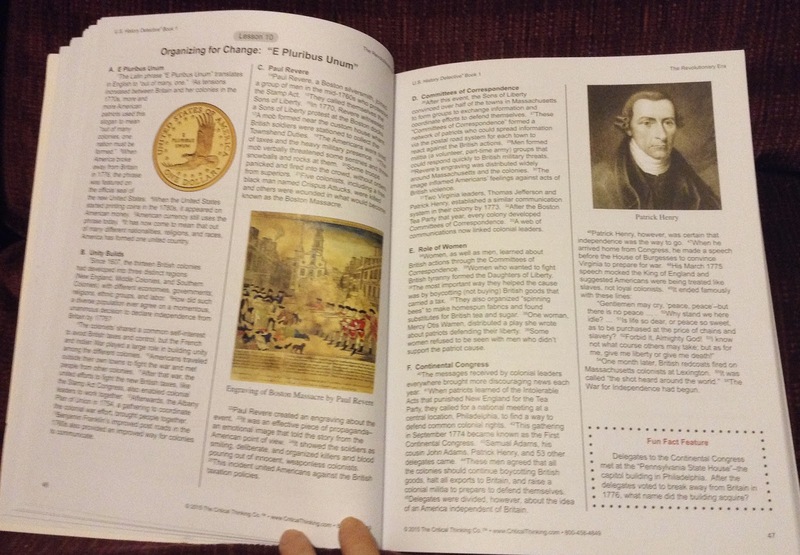 This lesson includes three pages of reading, maps and a political cartoon. In all of the lessons, the reading is broken down into sections (A. Who Gets the Ohio River Valley?, B. George Washington Fights for Britain, C. A Rough Start for the British, D. A British Victory With Important Consequences) and each sentence is numbered. The maps and other images are in color, which certainly makes it more appealing. After the reading, there is a roughly two-page worksheet to be completed. Usually those consist of a few multiple choice questions, and some sort of written response. In the multiple choice questions, you have to do more than just figure out the correct answer -- you also have to give the sentence number(s) that best supports your answer. This isn't just about what you know -- it is about being able to read text and support your conclusions. This lesson has two non-multiple choice questions. One has them describing the meaning of a political cartoon. The other, longer one, asks them to explain how the French and Indian War changed North America. There are two more lessons (Resistance to British Rule; Organizing for Change) that are set up in a similar way. Then there is a one-page review of those three lessons. That review is shown here, to the left. In this case, it is a matching activity. After the next three lessons, there is a bonus activity that reviews lessons 12-13. Then lesson 14, which is followed by a review of this entire Section (lessons 8-14). The review includes three separate activities. The first is on cause and effect, the second has them identifying where various quotes come from, and the third reviews vocabulary from this section. If this is the only thing you are using for US History, it is probably a little light. 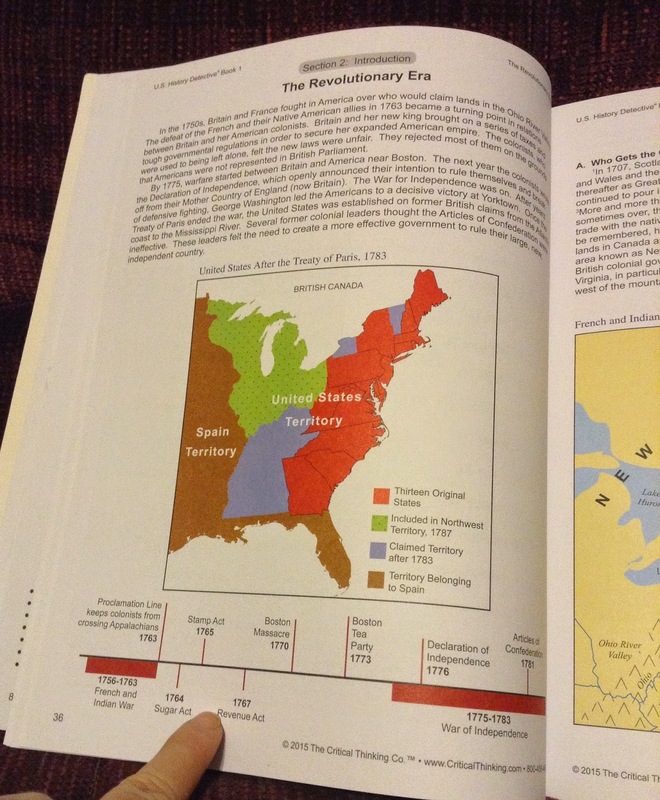 One thing I like though is that my oldest has had quite a bit of US History already, but not in an organized class. With this, we can work through the materials and as we get to lessons that are unfamiliar, we can stop and do a little more reading from elsewhere. To use this to supplement another US History program, we can pull some of the lessons out, especially ones that give perspectives not covered in our regular program. In particular, I love the essay questions. They require the student to have a grasp of what they have just read, and they require the student to be able to concisely summarize the information. I simply love this book, and I fully intend to purchase everything that Critical Thinking Co. puts out in the History Detective series. We also love World History Detective: Ancient and Medival World Civilizations.